As the temperatures (finally!) cool down here in the lowcountry, the upcoming holidays have us in the attitude of gratitude. When asked what you are most thankful for, what do you say? Certainly Hurricane Matthew left us with lots to be thankful for. Regardless of your situation, the list of things to be grateful for is long if you are willing to look: health, gainful employment, access to healthy food, a (beautiful) place to live, a car to drive and the list goes on. A recent social media study (1) shows what will likely come as no surprise: the thing we are most thankful for is not a thing at all – it’s people. We all have people who make an impact on our lives and give us the priceless gift of meaningful relationship. This may appear as the wisdom of an older relative, the open hearted spirit of a child, or the helpful guidance of a mentor. The best way to say “thank you” to those important people in your life is by showing up when they need you. However, to ensure you are there for the important moments and people of your life, you have to take care of YOU first. Making the decision to take better care of yourself can sometimes feel overwhelming, especially if your inclination is to take care of everyone but yourself . The idea of starting out with an extra hour each day to devote to improving our self-care can also feel impossible. While some self-care practices do require a time investment, some only take a few minutes and all of them are worth it. Here are 3 key ways to take better care of yourself so you can be there – physically and mentally – for the ones you love. Life is busy, unpredictable, and will pull you in every direction if you let it. You may find that you lay your head down at night and wonder what – if anything – you accomplished with your day. As a result, you feel stressed and unmotivated at best and at worst – you’ve missed opportunities to create cherished memories with your loved ones. Take the time to be intentional with your life, starting with each day. Whether you use your phone or a paper planner, sit down for 15 minutes the night before and map out your day to include the things you want to accomplish. Whether it is exercise, reading, writing, calling a loved one, writing a thank you note – be specific and schedule it along with the rest of your daily tasks. In the morning, you can even visualize yourself getting all your goals and tasks done. Once you begin the habit of planning your day, you’ll be surprised by just how much time you have. 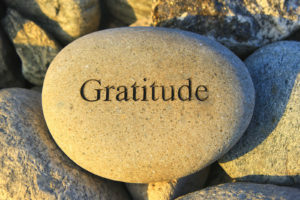 Studies show that people who focus on finding gratitude see positive results in many other areas of their lives. (2) Begin your day by thanking the universe for each thing you have to be grateful for: the roof over your head, your family, friends, the sunny day, etc. If the morning seems too frantic (which you can change, you know), then set an alert on your phone or keep a post-it note at your desk reminding you to take a “gratitude break”. Finding gratitude is a quick, simple and free way to improve your self-care today, and can set the tone for the rest of your day. Taking time to appreciate what we have opens up our hearts to receive abundance. The proven health benefits of exercise and a healthy diet (3) are widely accepted and understood. If that’s the case, then why aren’t we all in perfect health? World renowned leadership expert and author, Dr. John C. Maxwell says, “the greatest gap in the world is the gap between knowing and doing.” How do you bridge that gap? Make it personal. To be there for the ones you love down the road, there is no disputing that you must care for the only body you have. Make it personal and you will make it a priority. Start simple: instead of going on a highly restrictive diet, focus on adding more vegetables to your daily dietary intake. Replace your morning toast with a green smoothie, add powdered greens to your water Instead of spending an hour at the gym each day to start, focus on walking 15-30 minutes each day. You’ll be amazed what small changes over time can accomplish. At Absolute Wellness Center, we care about helping so you can care for those who matter most to you. Visit this page of our website to learn about how chiropractic can help you reach your health and wellness goals, naturally. For more on massage therapy, click here. For acupuncture, click here. Call our office to learn more today. Dr. Doyle is the principal chiropractor and owner at Absolute Wellness Center.